The gladiatrix was a very unique gladiator class in that this was the female version of the gladiator. In ancient roman times, women had the opportunity to fight in the Colosseum as well and from all accounts lived a very similar existence to the male fighers. 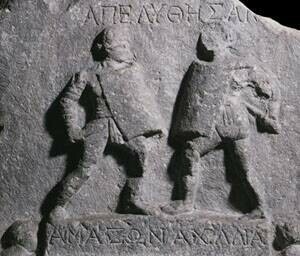 While there is not a wealth of information on these female fighters from the Roman empire, we know they existed from stone carvings depicting these brave souls, and there are even texts from a governor named Hostillianus who proudly announced that he was the first to have these female gladiators in the history of Rome. I think the most important part of the gladiatrix is to prove they did indeed exist, and while we have alluded to a couple of points that signal their existence in the stone carvings and governor Hostillianus writings, who proclaimed that he was the first to use female gladiators. Additionally there are yet more pieces of evidence to also learn about these mysterious fighting women of Rome. The first of these is when Cassius Dio who is he mentioned in the breaking in of the Colosseum that gladiatrix were used. It’s believed they were used as venatores, animal fighters or hunters, and while venatores were not actually a gladiator class they were very much in the same bracket of entertainment as the gladiators. A statue of a gladiatrix gladiator. 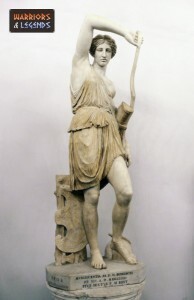 Before we can answer many questions about the female gladiators or Rome, or gladiatrix, we need to consider the class system in ancient Rome, as this would have also affected who would and could be a gladiator, how it was viewed in society and what implications it may have on the society of Rome as a whole. In Rome there were various classes, starting with the Roman citizens who were divided into the upper and lower classes, for a upper class citizen it was not actually allowed for them to compete in the gladiator games at a certain point. As we almost certainly know that some form of female gladiators did exist, the next points to ponder are how did they live, and what was their daily life like? Well as our previous question answered, the training and lifestyle of a female gladiator likely depended on her social status. A women from an upper class background would not live in a gladiator training school, as this would not fit in with her lifestyle. If however the woman was a slave or from lower classes their might be more change of her daily life as she might decide or have to live in the ludus with the other gladiators. A carving of the rare gladiatrix gladiator. If we now presume that women did in fact live and train in a ludus there was likely some separation of the male and female gladiators. This might not have been possible at all ludi, but we can presume that women had slightly different treatment to their male counterparts, perhaps even living closer to the ludus owner. Of course a lot of this is presumption and it could have been that the gladiatrix did in fact just live in exactly the same quarters as every single other gladiator. One area that is difficult to pinpoint is what weapons and armour the gladiatrix’s would have used. The most logical initial answer is to presume that if all things are equal that they would have had similar classes to the male gladiators. However the flaw in this argument is that we can with a large degree of certainty say that there were not as many female as male gladiators, and therefore it was likely they did not cover all the gladiator classes. Myth or reality, it seems the female gladiators, the gladiatrix were indeed real. All the evidence points to the fact that women were allowed, and did step into the Colosseum and do battle in some form or another. The only mystery that remains is to what level they were trained and skilled,the frequency of their appearances, and how and what they participated in. However, all the evidence we are likely to find, is already found and now we are left with what is really just simple deduction of the facts.